OTLA extends its congratulations to the award-winners and competitors in the recent OTLA Cup trial moot. This annual event provides law students from across Ontario with the unique opportunity to argue a jury trial in front of a judge of the Ontario Superior Court of Justice. The OTLA Cup also familiarizes law students with OTLA’s work. 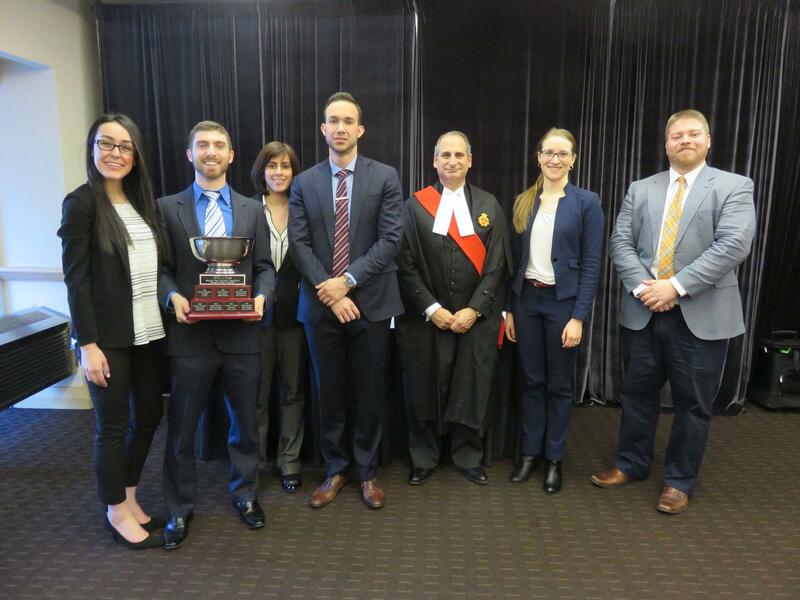 This year’s event, which took place March 4, 2017, was particularly special because it was the first OTLA Cup to feature a team from Lakehead University’s law school. Ryan Venn and Amber Bonnell proudly represented their school. The problem being argued was a motor vehicle accident that took place at the centre line on a snowy winter road, implicating in litigation not only the drivers but also a commercial host, a Good Samaritan, and the municipality and its contractor. The Honourable Justice Stephen Firestone of the Ontario Superior Court of Justice kindly spent his Saturday presiding over the hearing. His Honour provided invaluable advice to the competitors, and alerted them to resources for handling significant issues that arose in the litigation, including advice on the content of opening addresses in jury trials and on the use of expert reports. Congratulations to the winners and to all of the participants! OTLA thanks the sponsors of the event. The prizes were sponsored by: Boland Howe LLP, Greg Monforton, Bonn Law, Will Davidson LLP, H. Bruce T. Hillyer, and Bergeron Clifford. Collins Barrow, BridgePoint Financial Group, and Oatley Vigmond sponsored hospitality. Team sponsors were Derek Nicholson Professional Corporation (uOttawa team), Bogoroch & Associates LLP (Queen’s), Lerners LLP (Western), White MacGillivray Lester LLP (Lakehead), and Scarfone Hawkins LLP (Windsor). OTLA thanks Beament Hebert Nicholson LLP for its assiduous work in organizing this year’s OTLA Cup.